Totally calm day at the field! 2-16-07-16 Today was one of the very few, perhaps only, totally calm day at our flying field this season. I took both my Apprentice and PT-40 out for a spin about 9:00am. I flew the Apprentice first and decided to do ONLY take-off's, touch-and-go's and landings. It was fin to fly a complete battery, about twelve minutes that way. Our club training/safety officer had sent out an email earlier in the week with some guidelines for good landings so I wanted to try to implement them. The two that stuck in my mind and seemed to really make a difference were a) always have a plan, and b) once in your descent with a good approach angle use the throttle to control descent rate if needed. That really works! I picked a strategically located tree about 30 degrees to the right of my standing position alongside the runway to begin my turn, paying close attention to my altitude as I entered the turn. I also reduce the power to near idle at the same time. As the plane turned right toward and then down the field I slowly brought it back to level with the ailerons and using the elevator watched the descent rate. Usually I didn't need to give it any power or at least very little. As I neared the ground I remembered another of his points, to gently flare by giving just a bit of up elevator. Magically it worked quite well. I didn't hit the ground hard or with my nose wheel first once! The roll was also smooth and straight ahead so I could pour on power and make a smooth lift off and go around again. Then I decided to go up with the PT-40. It is much heavier and powered by a 4-stroke glow engine so it was quite a bit different from flying the Apprentice but after a few passes I was able to do reasonably well with my approach and accelerate to climb out again. Actually I don't think I touched down at all until my actual landing. Not sure why, I just felt nervous with this place compared with the Apprentice. One noticeable difference is speed on approach which is somewhat faster with the PT-40. Another difference is the response to throttle. The Apprentice has enough power to mussel out of just about anything. But you have to "fly" the PT-40 back into the air. So I was afraid to let it get below flying speed and touch down. On my final approach and landing (I intended it to be my final one ahead of time) I made a good approach but but floated it when I flared and then came down nose-low, killing the engine. The plane was fine and I actually dead stick "taxxied" it to the gate into the pit area so it wasn't a bad landing, just not perfect. I plan to go out again on the next good day and practice some more. It feels kind of good to have reasonable take-offs and landings! Balloons are pretty save on the landing strip! 2016-07-13 Wednesday evening our club scheduled a balloon popping contest. A number of balloons about a foot in diameter were pinned to the ground at random locations in the landing zone on our airstrip. The idea was to pop one while attempting a touch-n-go. It was a very windy evening with both strong winds and totally unpredictable gusts which made ALL flying challenging! I did one flight with my super cub and realized IT did not present any threat to the balloons! My son flew is Elder 40 and did threaten a couple of balloons a couple of times but no harm was done to either balloons or his plane. Our club trainer/safety officer did, after a number of attempts manage to pop one and our vice president also popped one after considerable number of passes. No one else had the courage to commit their planes to the elements. We agreed that it was such fun we will definitely try it again, hopefully on a bit quieter wind day! My Apprentice taking off at our son's in MN. 2016-07-10 Our family gathers each year around the 4th of July at our son's house on a lake in the Minneapolis area. 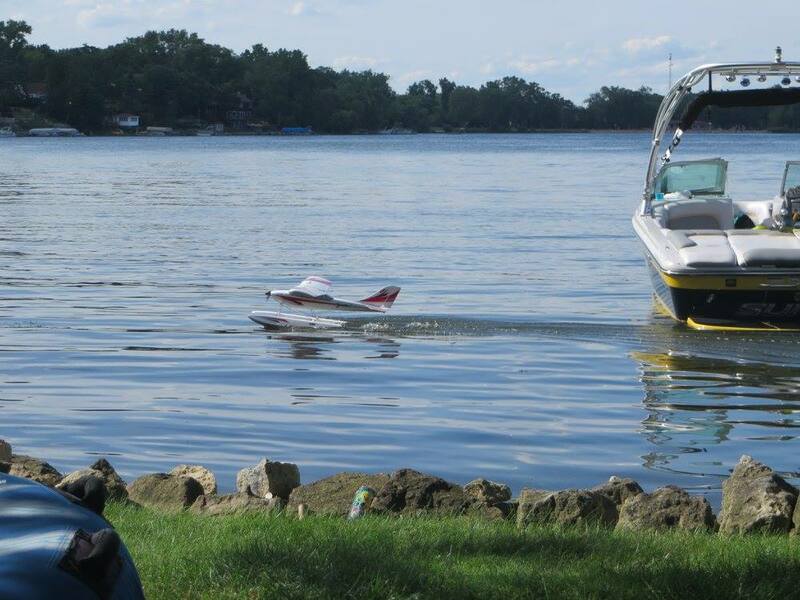 This my other son and I (both from Burlington, WI) brought planes to fly off the lake. I've had the floats for my Apprentice for several years but had not put the floats on it previously. That took me quite a while. Then I had problems getting the float rudder straight when the rudder was straight. The control wire from the front wheel axle to the float rudder was about 1/2 inch too long so there was not enough clevis adjustment in one direction to allow alignment. I finally found a way to make it pretty close. Once that was done I had about ten successful flights. The plane is very easy to get off the water and landings are only a challenge because landings are a challenge! Water is a bit less forgiving than land but I managed to make all the landings fairly well, most quite smoothly. A couple included some potentially damaging bounces but none actually resulted in any damage. Escapade in the air again - at last! 2016-07-02 Yesterday was our Friday mowing day at the airfield. Good turn out and the field is beautiful. I took my Apprentice out and did one flight with it. The wind was directly across the airstrip when I took off but switched all over the place while I was flying. Thankfully I got it back on the ground safely so packed up and came home! Today seven of us were there by about 9:30. Temperature was in the upper 60s and there was very little breeze. Everyone got some good flights in. I flew my Escapade once for about ten minutes. It flew beautifully and I had a very smooth landing. I also flew my old foam P-51 electric and the Apprentice. I intended to take my Spitfire out but managed to forget to put it in the car. The star of the show was my son's newest plane, a VQ models P-39 Airacobra. He greased the landing, even taxing it into the pit area! My Great Planes Escapade cooling down after two successful flights, one good and one "perfect" landing! 2016-05-30 Memorial Day! What a beautiful day God gave us for Memorial day here in southeast Wisconsin. Blue skies with fluffy white clouds. Temperature in the 70s and 80s. Almost not wind or breeze, the kind of day an RC pilots longs for. So my son and I and a friend went out to our Silver Eagles RC Flying Club airfield at 9:00 this morning. My primary objective was to fly my recently repaired Great Planes Escapade. I've had the thing for about three years or so. And each year it has ended up in the shop. And would you believe it? This year has been no exception. After a nasty crash toward the end of the 2015 flying season I finally got it repaired and two weeks ago, I once again smashed it up on a takeoff attempt. It simply did not want to get off the ground. To my dismay and embarrassment the CG was way off after the repair. added weight in the nose which had been required previously. So today, with that weight removed and the wings repaired, it was anxious to get into the air. It's a good thing too, because I came near screwing it up on both takeoffs with overcontrol responses to its lift off behavior. Being a very responsive sport plane it only needs nudging of the controls to keep or return it to course. My nervous fingers had trouble nudging! But once in the air it flew beautifully. It is just a very responsive, great flying plane! Good to see it in the air again. Boy Scouts in the air! 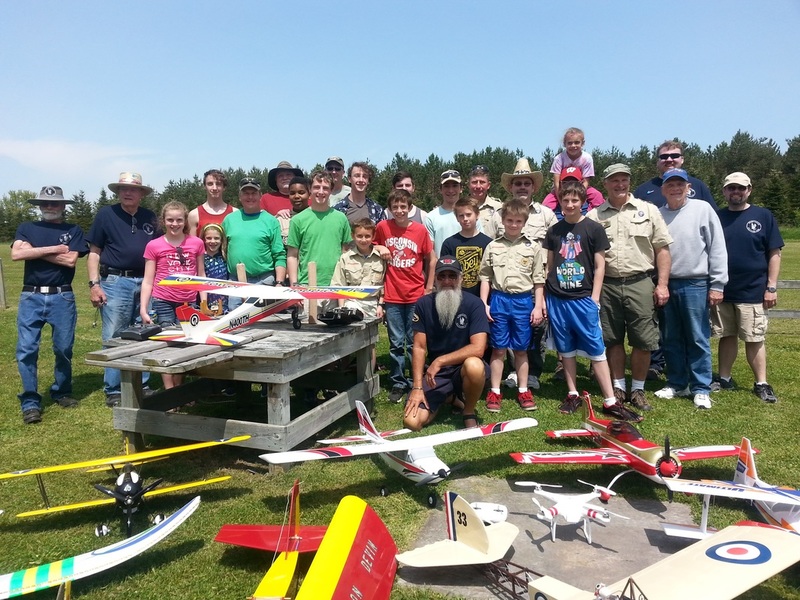 2016-05-21 Today about twenty boy scouts, leaders and family members joined the Silver Eagles RC Flying Club at our flying field. The club members met at 9:00 to discuss our plans and get planes set up. We agreed to three planes in the air maximum simultaneously. 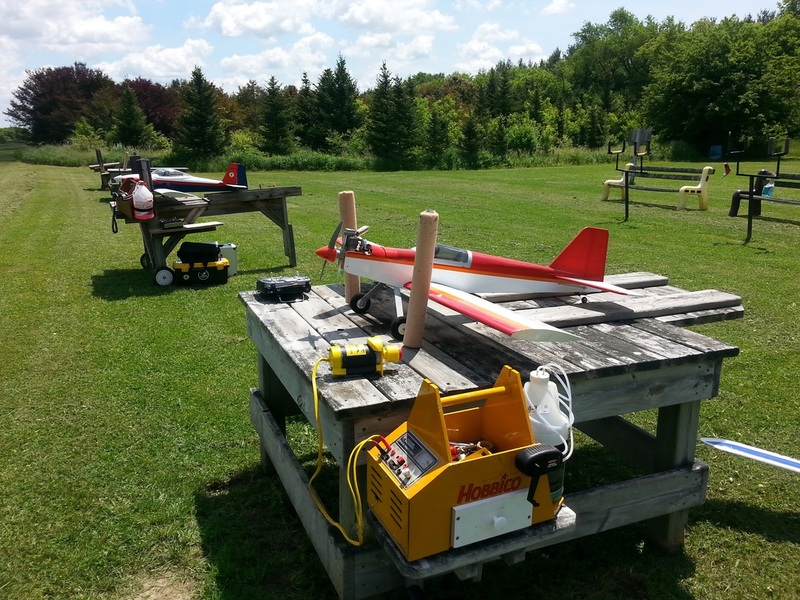 Then we set up four flying stations, each staffed with a pilot and a spotter/assistant as needed. At my station club member Lee Bergstedt was my spotter and I was the pilot. I set up my Apprentice S for the day. I had never flown with someone else using the buddy box system before. Basically you have two transmitters, a master which the pilot has and a slave which is given to the student pilot. There is a button on the master transmitter which when pushed gives control to the slave transmitter. Releasing it returns control to the master. Our plan was that the pilot would take off into the wind headed east, make a pair of left turns so the plane was flying west on the north side of the field and then turn control to the student. The student's job was to fly along parallel to the runway, make two left turns and pass back east over the runway and then repeat that loop until their time was up, about five minutes. Brad, our training pilot, giving a brief ground school and pre-flite briefing. Scouts, leaders and family members at the flying field behind some of the planes on hand for the event. The wind was a bit unpredictable, being nearly crosswind from the north a good bit of the time and fairly strong and gusty so achieving all of the above offered some challenge. I flew with four students and all did very well. After a pass or two their turns tracked pretty well and all maintained a safe altitude and stayed north of the pit area. Flying over the pit area is the biggest no-no of all! All the planes flown were electric except one which was glow powered. The Apprentice S (pictured with my May 7th comments below) served very well having a pretty long battery life and rock solid stability. The scouts baked apple and cherry cobbler in dutch ovens for the gathering and the club provided big juicy hot dogs and chips. We started at 9:00 and ended at about 2:00 with everyone getting all the flying they wanted. It was really fun for everyone. 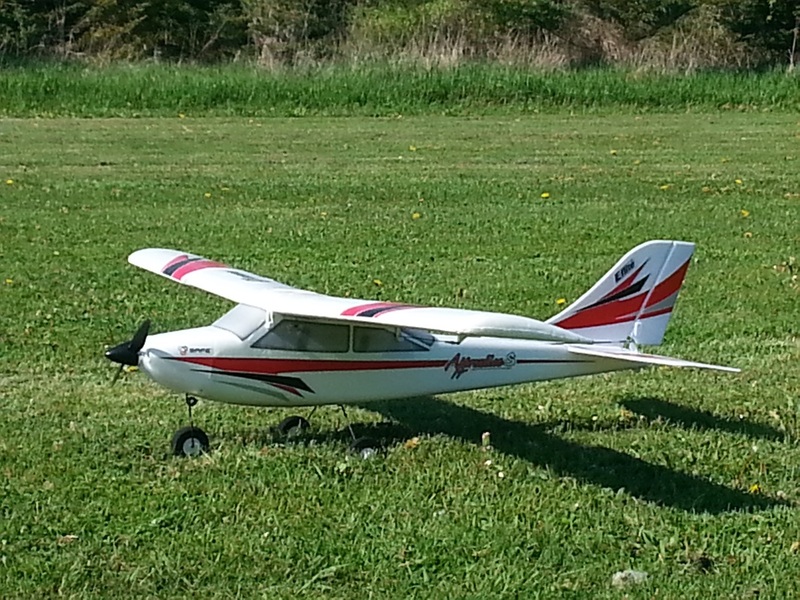 Then I decided to try my little Horizon Hobby Supercub. I got it off and had a good flight but had to fight it constantly to keep near the field. The winds aloft were very strong and gusty. Amazingly I got it back on the ground upright, a rare thing with that plane on grass. The battery still had quite a bit of juice left and even though I had a feeling I was pushing my luck, I decided t launch again. I got it up, but the winds were even worse and this time, fling downwind it got too far away quickly, then when I tried to execute a left turn and bring it back the wind whipped it around and I lost orientation. Shortly after I cut the power as it dove irretrievably (for me anyway) for the ground. My two friends and I found it but it is in many pieces. Will it fly again? I think so. It is of foam and has been through a whole lot, I can't believe this was its death blow! But it will take a lot of foam CA and at least the stabilizer from the tail section of a friend's plane that he gave up on! 2016-05-07 This afternoon my son and I again went to the field to fly. I took my Great Planes P-40, the trusty old E-flite P-51 and my Great Planed Spitfire. The P-40 flew well with the engine servo replaced. I did have to reverse it with the transmitter. It took a while to get things trimmed out and the wind was really crazy, coming from all directions, changing often. But I got in three good twelve minute flights with no mishaps. Next I put a battery in the P-51. It took several tries to get it off our grass strip (normal for it) but once in the air it flew very well. The wind made life interesting but I enjoyed one six or seven minute flight, again with no mishaps. Then after giving my son a hand with the Twinstar I decided to try the Spitfire. But the receiver was dead so no joy. As I mention on the Spitfire page indeed the receiver was dead and I've replaced it so maybe next trip to the field it will be in the air! All in all it was a fun couple of hours. in the out-of-doors with my son. 2016-05-07 With the FAA breathing down our necks, seeing us RC flyers as a potential national threat, and wanting to be a good, law abiding citizen I decided (since it is too windy to fly) to put stickers containing my name, phone, AMA and FAA numbers on all my planes hanging in the garage. 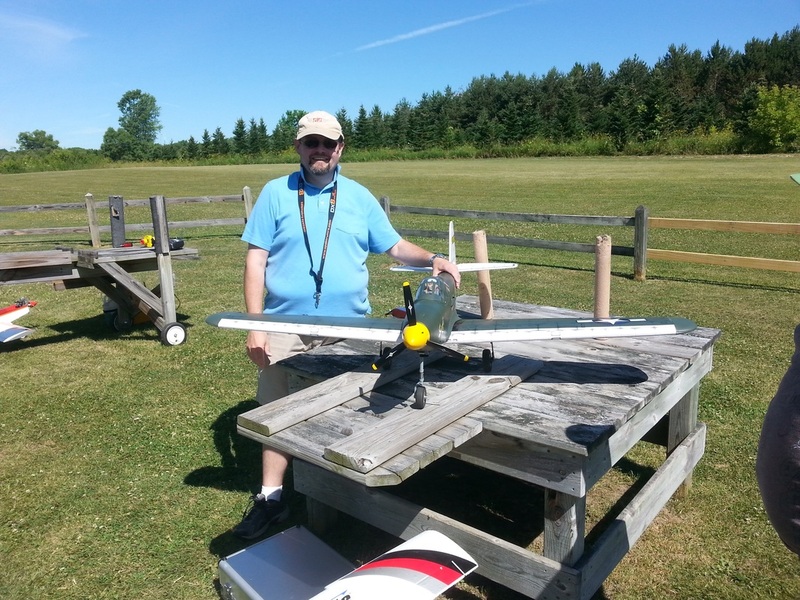 All went well until I got to my very old and beat up foam E-flite P-51. When I brought it inside to tape up the cracked engine cowl and removed the canopy I was surprised to see a lot of loose foam particles! You guessed it, mice! ​It appeared that the damage was minimal, just a bit of foam chewed away. So I vacuumed that out, turned on my transmitter and plugged in a battery just to make sure. But instead of the nice, happy musical chime that says "I'm ready," I was greeted with bleep bleep bleep, chirp chirp chirp, with the chirps in a low, sad, mournful monotone! ESC wires chewed apart by mice during the winter storage in my garage. 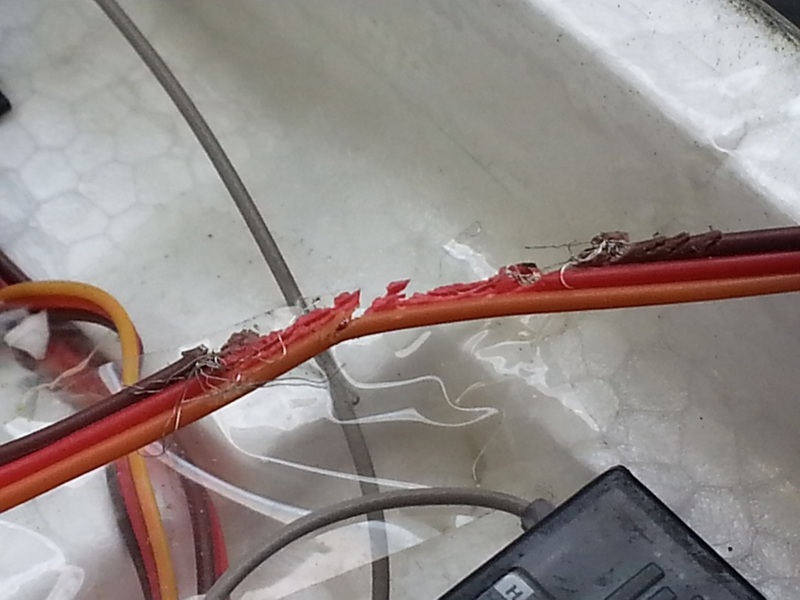 later, as I probed various wires plugged into the receiver, the problem became evident. The three wires from the receiver to the ESC were almost completely chewed off and one of the aileron harness wires was chewed in two! If that is "all" then it'll be pretty easy to get back in the air. I can repair the ESC wire and replace the harness. But it makes me think I need a bit of closer inspection of all my planes, foamy or not. All of them have tasty wires inside! So, if you live in mouse country, and who doesn't, add a mouse inspection to your planes that have been hangar-ed all winter. The repaired ESC control wire and ready for battle once more. Footnote: I was able to repair all the wires, thanks to the fact that I have been soldering wires since I was about twelve years old and that I have a stash of control wires cut from the various servos that I have destroyed (or that died like the one in my PT-40 yesterday). And using "liquid tape" made it a lot easier than trying to use shrink wrap or electrical tape to insulate the soldered the wires. ​It isn't pretty but it works! ​Now when I plug in the battery I hear that happy, musical "I'm ready!" ​My proud, battle scarred P-51 has brought down yet another dangerous enemy in the winter skies of Wisconsin! 2016-05-07 Yesterday was an absolutely beautiful day here in southeastern Wisconsin so my son and I went out to our Silver Eagles RC Flying Club field to fly. The main project was to get our Hobbico Twinstar in the air. We've had almost non-stop problems with getting and keeping the two ASP 0.25 engines running on it since getting it a couple years ago. So a week ago ago I opened up both nacelle's, removed the tanks and hoses, cleaned and inspected everything and then carefully reassembled them. I gave special attention to tightening the plug where the fuel tubes enter the tank. I'm thinking that was the primary source of our troubles in the past. If you don't tighten that screw "severely" the tubes aren't sealed completely. That is likely the source of the air bubbles we had seen in the fuel line. Anyway, the result was rewarding! The engines were easy to tune and the plane flew beautifully! ​​I intended to fly my Great Planes PT-40. But, unhappily, even though I had it going in the driveway a couple weeks ago, the throttle servo failed! I don't think I've ever had a servo failure unrelated to any physical incident before. But after getting it home last night and checking everything out, that was the culprit. So, maybe today? ​I ended up flying my E-flite Apprentice. It was pretty windy and gusty but the Apprentice handled the conditions very well. I was reminded once again what a nice flying plane it is. It is big enough to be easily visible. The SAFE technology makes it stable even in gusty winds. It has more than enough power to deal with nearly any situation and its flight characteristics are great. It is just a joy to fly. I take it every time I go to the field so no matter what else happens (like failed servos!) I have at least one plane that will make the trip worth it! My Apprentice S ready for takeoff. ﻿2016-04-25 Saturday, after taking the grand-kids to the zoo I decided to see if I can still fly. So I packed up my Apprentice, DX-8 transmitter, batteries and a water bottle and headed out to Bong State Recreation Area just a few miles from my home. The main feature that I like about Bong is that it has two paved RC airstrips surrounded by very few tall trees. And right now, with spring just coming on, should your plane go down it would be pretty easy to find. It was fairly windy but thankfully the wind was directly down one of the airstrips so posed minimal problems. The result? About a dozen take-offs and landings with no mishaps! That is better than I normally do on our club airstrip in mid season when I should be at my most skilled! Last week I actually got all my planes out, charged up the batteries for/in all of them and even fired up all the glow engines. They all started easily, showing no obvious damage from sitting all winter. So I'm excited about the coming Spring and summer flying season. I've got the itch to hear some engines in the air! 2016-04-19 Well, I never got around to working on the damaged Escapade so I took it back to the garage. 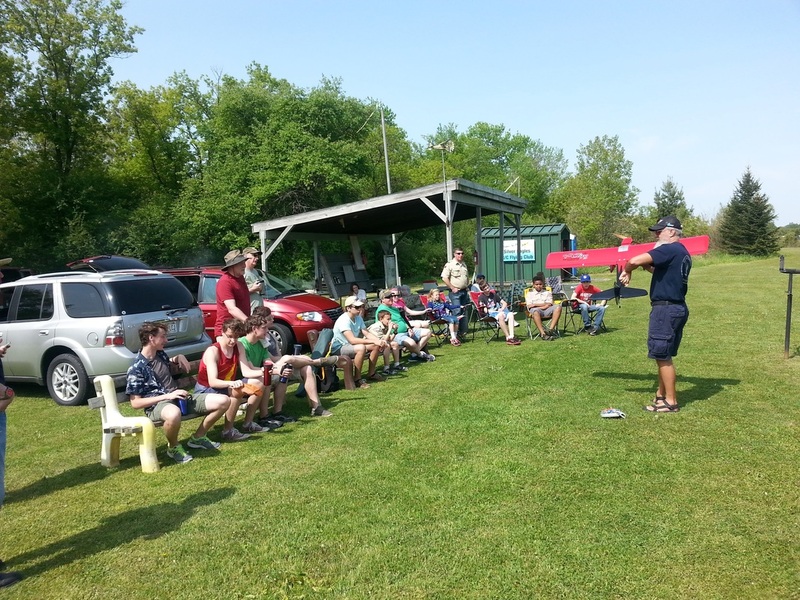 But after a good club meeting last Thursday night and an even better turn out for field cleanup on Saturday the bug is stirring. 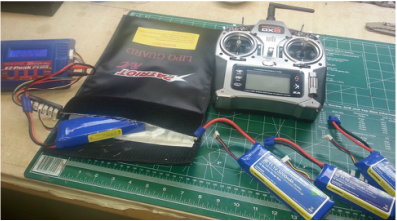 Today I got my batteries and transmitter out and set them up on the bench to charge. Amazingly, even though I failed to properly discharge my lipo batteries to the recommended storage temperature they seem to be OK. My Spektrum DX-8 transmitter also took a charge. So now, if the weather is friendly again Saturday I just may get my Apprentice and possibly even the old beat up Supercub in the air. And who knows before Saturday I might even get one or more of my glow engine powered planes out and see if the engines survived winter storage. 2016-03-03 Here in Southeast Wisconsin Spring, or anything like Spring is very unpredictable. Last Saturday was quite warm, perhaps 70 in some places. It was also a bit windy. And only a few shaded patches of snow left. They say it may be back up in the 60's again next week. But right now it is not. In fact earlier this week we awoke to zero. And we have several inches of snow again! So I haven't really gotten serious about flying, planes or much of anything similar. But I did get the fuselage of my Escapade off the rack in the garage on Monday and set it on my work bench. Poor thing didn't end last season well so it needs some fairly significant work on the front of the fuselage. At least is is where I see it every day. Maybe soon I'll even work on it! It flies so nice between crashes.